If you are looking for how to cook salmon fillets in the oven you have come to the right place! 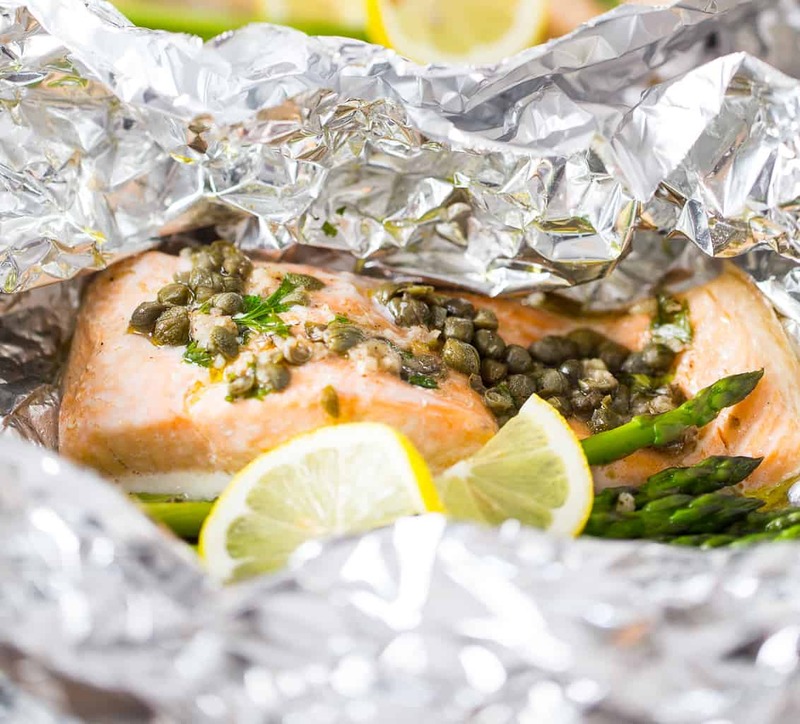 Salmon baked in foil packets are my new dinner obsession, with an easy cleanup and fool-proof method for perfect oven cooked salmon every time. I can’t be the only one out there who is desperate for new, easy weeknight dinner ideas. I seem to be get into a rut of finding something new, and then making it to DEATH until I’m sick of it, and the cycle starts over again! However, one thing I’ve learned is that there are almost infinite ways to cook salmon in the oven, and that a little creativity can yield a new, healthy salmon dinner recipe quite easily. Of course, since I’ve decided this is one of the best salmon recipes I’ve created in a while, I’ll probably make it to death as well! Its easy cleanup and rich but clean, fresh flavors, mean that I want to make it again and again. Seriously, who doesn’t love a healthy salmon recipe??? Even better when that recipe comes together in a tidy little package of foil. 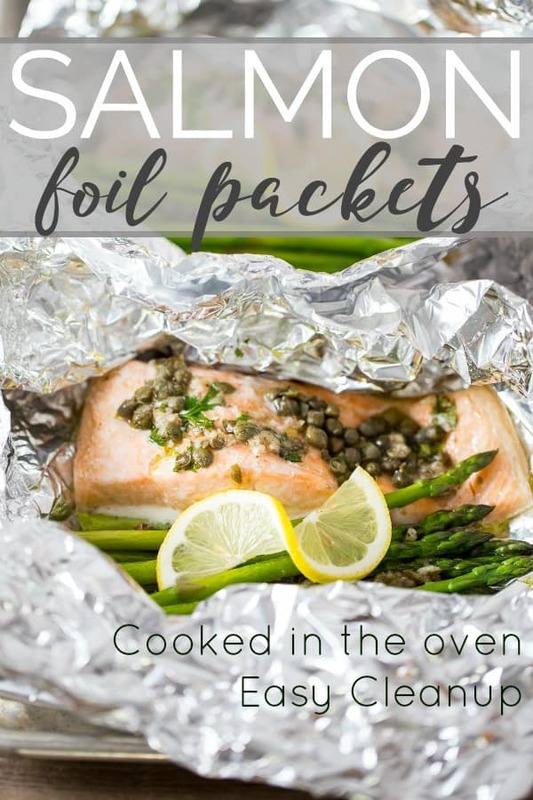 This recipe was my first time experimenting with foil packets, and I was delighted to realize that cooking everything together – a salmon foil packet with the vegetables included – made cleanup SO much easier than eating dinner and then remembering to clean up salmon skin later. 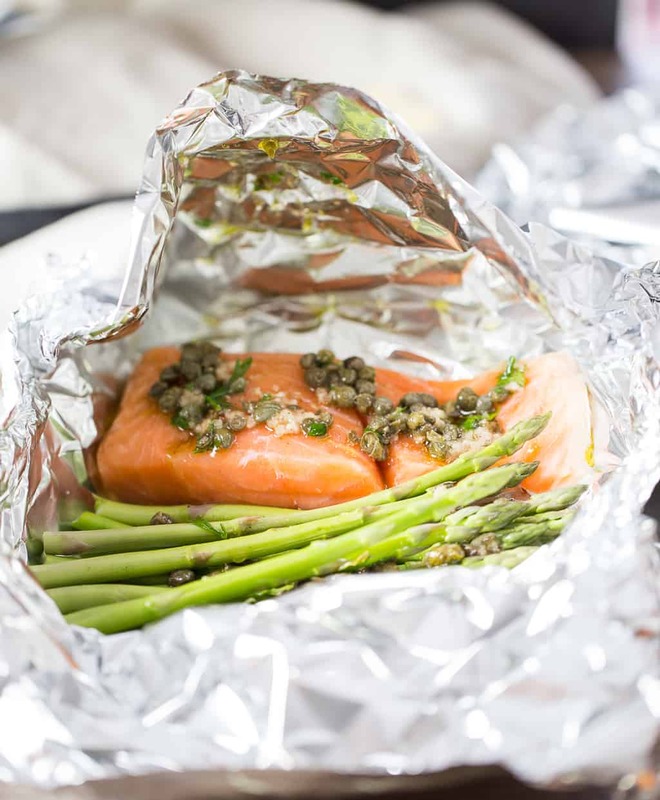 Have you ever baked salmon in foil with vegetables? What vegetables did you use? How did you season your salmon? 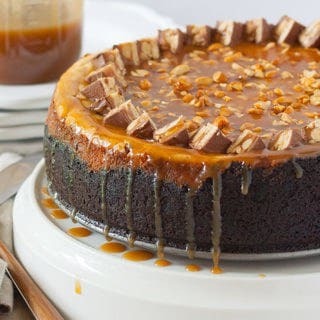 Tell me in the comment section below the recipe! 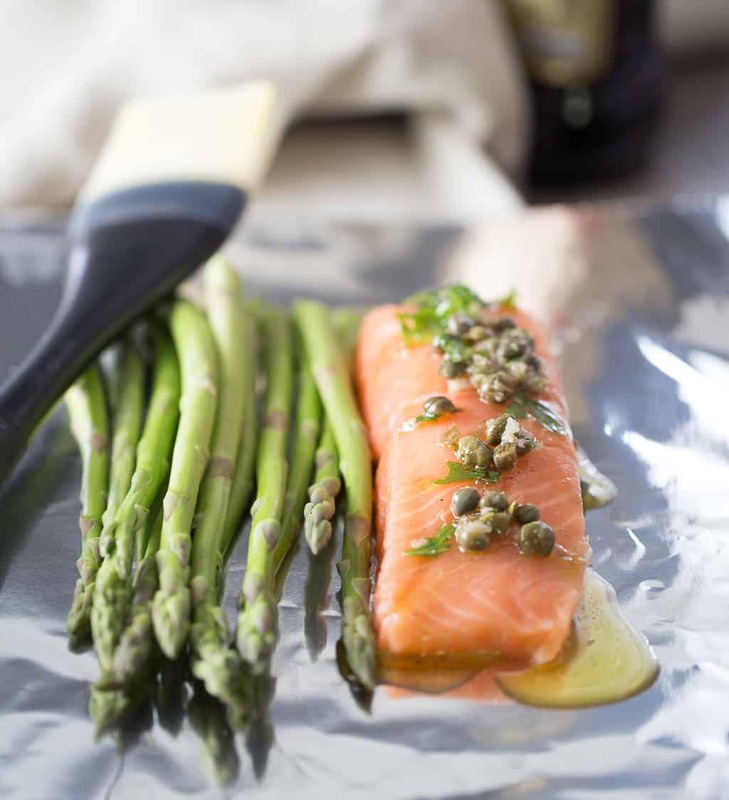 Preheat the oven to 400 F and mix all of the ingredients except for the salmon and the asparagus in a small bowl. 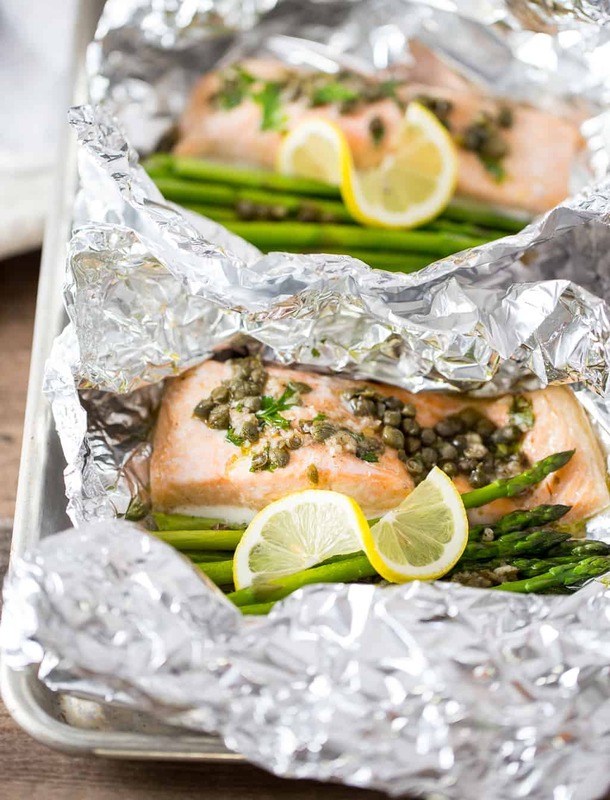 Tear off three sections of foil - each between 12 and 14 inches square and place each piece of foil on a sheet pan. I was able to fit all three pieces on my favorite standard home cook sized sheet pan ( which is called a 1/2 sheet pan ) with the edges folded up a little bit so they all could squeeze in. 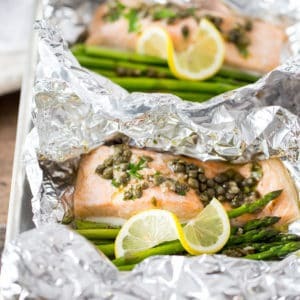 Place on salmon filet, skin side down, on each piece of foil. Divide the asparagus among the foil squares evenly. 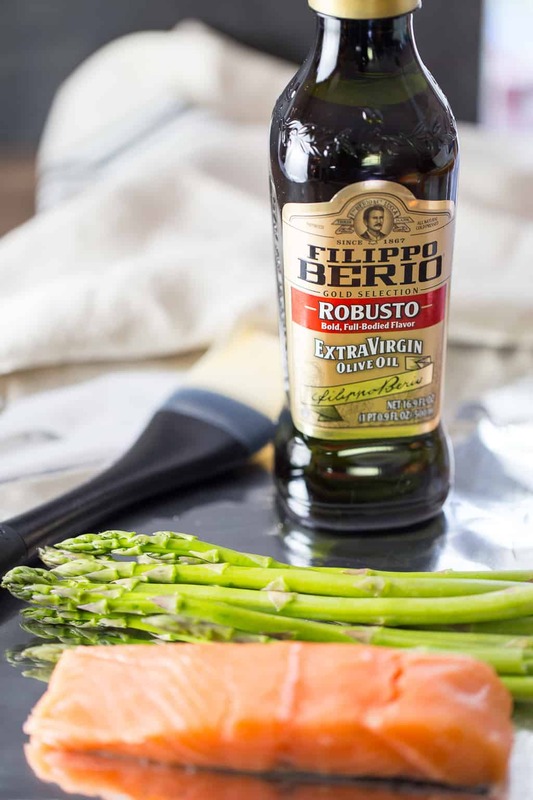 For each packet, put two teaspoons of the olive oil and seasoning mixture from Step 1 on the salmon and one on the asparagus. Fold the left and right sides of the packet to the center, and then fold the top and bottom sides of the packed to the center, crimping them with your fingers to seal. It doesn't have to be perfect, but try to get it pretty secure. 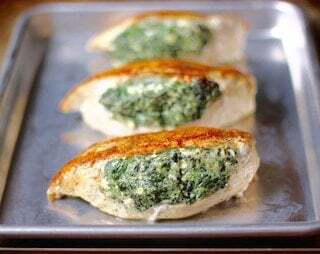 Cook for 18 min at 400 degrees F.
Do you think parchment packets would work as well?